For many runners, racing a local turkey trot is as much a Thanksgiving tradition as eating pumpkin pie. In fact, according to Running USA, it’s the most popular holiday to run a race. 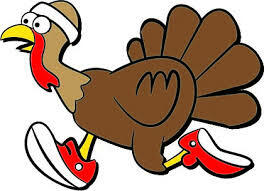 So before you start chowing down on turkey, stuffing, cranberry sauce and, of course, pumpkin pie, lace up your running shoes and gobble up a few miles at one of these local turkey trots! When: Thursday, Nov. 24, 8:30 a.m. Details: This 5k race is both runner and walker friendly, and participants can register as an individual or as part of a team. The event is chip timed and awards are given to the top three male and female overall winners. If you are unable to make the race but would still like to participate, there is an Outta Town Dash Around option. The event benefits Feeding America Eastern Wisconsin and a food drive will take place before the start of the race. Details: Both runners and walkers are welcome at this 5k race, and participants can register as an individual or as part of a team. All participants will receive a t-shirt and goodie bag. Awards will be given to the top 3 overall male and female finishers as well as the top 3 finishers in each age group. The race benefits Love, Inc. and a food drive will be held before the race. Raffle tickets will be awarded for items donated with raffle prizes including turkeys. When: Thursday, Nov. 24, 9 a.m. Details: Both 5k and 8k races are available at this event. All participants receive chip timing, a quarter zip fleece top and cinnamon rolls at the finish line. Awards will be given to the top three overall males and females as well as the top three males and females in each age group. The race benefits Hunger Task Force. Details: Both runners and walkers are welcome to participate in this 5k event that winds through Whitnall Park and Boerner Botanical Gardens. Participants can opt to run as an individual or as part of a team, or sign up for the virtual race option. All participants get a race shirt and finisher’s medal. Details: Both 10k and 2-mile races are available at this event. The Mayor’s Cup Trophy will be awarded to the overall male and female winners in 10k race. Trophies will be given to overall male and female in 2-mile walk/run. Age group winners will receive a medal. Details: This year’s race benefits a variety of community events and projects, including Lasata’s Cycling Without Age, new playground equipment for the Thiensville Village Park, Portal, Inc., Interfaith Caregivers of Ozaukee County and COPE Services. In addition to the 5k run/walk, there will also be a 50-meter dash for kids ages 12 and under. Details: All 5k participants receive a t-shirt and goodie bag. Awards will be given to the 1st through 3rd place overall winners as well as age group winners. Tell us: Where are you racing on turkey day? This entry was posted in Race Previews and tagged Milwaukee Races, Race Previews, Running in MKE, Turkey Trot, Upcoming Events. Bookmark the permalink.